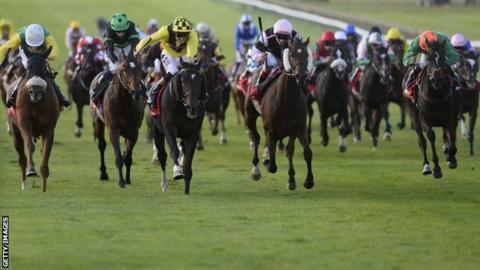 Big Easy produced a perfectly-timed run to win the Cesarewitch at Newmarket. The Tom Queally-ridden 10-1 shot hit the front in the final furlong to win the two-and-a-quarter-mile flat race. Favourite Quick Jack, with Richard Hughes on board, was travelling well in the closing stages but 25-1 chance De Rigueur and Big Easy went past him. Big Easy went on to win by three quarters of a length from De Rigueur, who edged Quick Jack (5-1) into third with Brass Ring (16-1) in fourth. It is a second victory in the race for trainer Philip Hobbs and owner Terry Warner, who won with Detroit City in 2006.